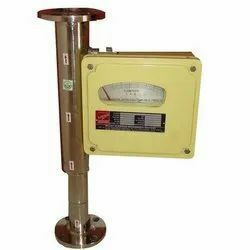 Prominent & Leading Manufacturer from Mumbai, we offer rotameter for water treatment plant, magnetic rotameter, rotameter for chemical industries, steam rotameters, plastic body rotameter and rotameter for flow measuring instrument. We are one of the leading manufacturer and supplier of Rotameter For Water Treatment Plant.We obligated to meet the quality standards, As per the customer demand. 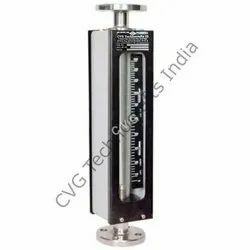 We are one of the leading manufacturer and supplier of Magnetic Rotameter.We obligated to meet the quality standards, As per the customer demand. We are one of the leading manufacturer and supplier of Rotameter For Chemical Industries.We obligated to meet the quality standards, As per the customer demand. Accuracy : /- 2% F.S.D. Suitable to measure flow rate of opaque/translucent liquid, gases Steam and vapour under critical operating conditions. Available in SS-316/ SS-304/P.P construction and flanged from 25 NB to 100 NB pipe size. High & Low flow switches. Flow totalizer and Digital Indicator. 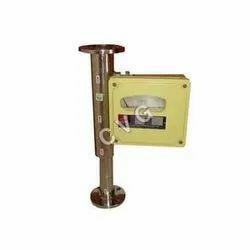 We are leading rotameter manufacturers & exporter in India. Our customized manufacturing capability and satisfying customers flow needs as given repute for delivering quality flowmeters with durability. 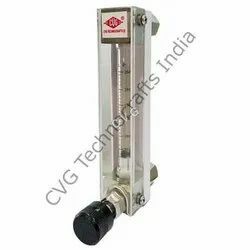 The wide range of rotameters for varied applications makes us amongst the best and most sort after rotameter supplier in india. Our mfg. range includes glass tube, magnetic, low flow, acrylic body, gas, multiple & metal tube, air purge, bypass, water rotameter & rotameters For valve leak testing. We are one of the leading manufacturer and supplier of Rotameter For Flow Measuring Instrument.We obligated to meet the quality standards, As per the customer demand. 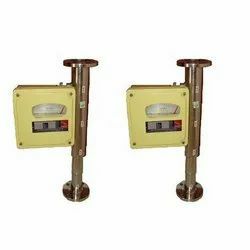 We are one of the leading manufacturer and supplier of Manometer for Chemical Industries.We obligated to meet the quality standards, As per the customer demand. Our distinctive range of Low Flow Rotameter is very popular amongst our valued customers in the domestic as well as international market. Offered rotameter is manufactured by inculcating latest technologies and making use of the finest quality raw materials under the strict surveillance of our qualified experts. The provided rotameter is perfect for measuring the low flow rate of water, air and nitrogen in OEM applications. In addition, our esteemed clients can avail this Low Flow Rotameter from us at most affordable prices. 0.6 to 160 LPH of water at ambient temperature. 10 to 5000 NLPH of air at NTP.Accuracy:+ 2 FSD. High & Low Flow Alarms. These rotameters have a heavy wall, are accuracy bored borosilicate glass metering tubes and are completely protected against ruptures and damages, with end fittings of stainless steel metal and aluminum side plates. In frontage, a clean plastic shield maintains the scale clear and easy to read, while an obscure unclear white rear shield offers a background to assist in discriminating the float location for precise readings. Variable area rotameters can be utilized in a variety of applications, which includes industrial and laboratory state of affairs. Some ordinary uses take account of carrier gas flow and fuel flow in chromatography and coolant flow indication. They are perfect for applications connecting purging, seal oil arrangements, bearing lubrication, and cooling water flow signal. 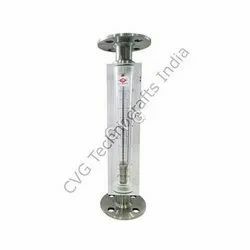 The CVG provides its valued customers with the superior and finest quality of the Metal Tube Rotameter that is created in agreement with the global standards. 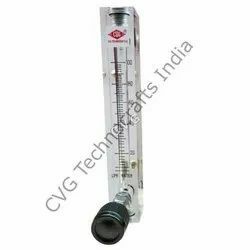 This Metal Tube Rotameter is generally utilized for solid and muddy liquids at high operating temperature and pressures. The Metal Tube Rotameters presented by us, are known for their rough construction, high presentation and resilience amongst our valued clients. 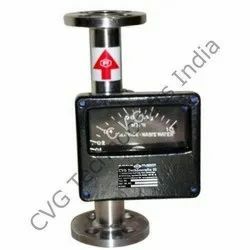 The CVG MTR series generally uses an essential and indispensable variable area flowmeter pattern: a float and tapered tube. As a consequence, these meters have extended linear scales and first-class pointer constancy. Both designs mark the non protruding float expansions and the magnetically attached indicators. With an ambition to fulfill the needs and valued demands of our respected clients, we are engaged in offering a pioneering range of Acrylic Rotameter. We manufacture this rotameter with immense precision using excellent grade raw materials with the aid of modern techniques. Our valuable customers can purchase this rotameters from us at market leading prices. 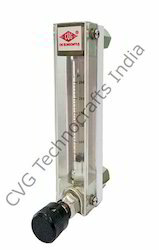 Offered rotameter is extensively used to protect equipments in case of tube failure by indicating leakage and high pressure of gases. 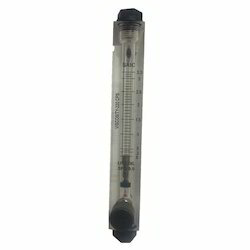 Furthermore, our patrons can avail this Acrylic Rotameter from us at most affordable prices. Suitable for accommodating a greater range of temperatures, flow rates and environmental conditions. We are one of the best organizations engrossed in manufacturing, exporting and supplying premium quality array of Acrylic Body Rotameter Flange End. 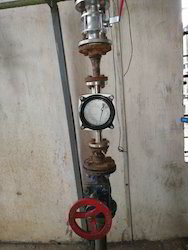 The provided rotameter is highly appreciated amongst our valued clients and manufactured by making use of quality assured raw materials & modern techniques. This rotameter is profusely used for measuring the flow rate of liquids and properly checked on distinct measures before delivering at clients' end. Additionally, this Acrylic Body Rotameter Flange End can be purchased from us at highly discounted prices. 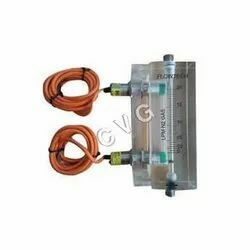 Driven by technical proficiency, we are counted as the utmost manufacturer, exporter and supplier of excellent quality range of CVG ByPass. The offered product is used for measuring bypass flow in pipelines. This product is precisely manufactured at our well-equipped production unit using supreme quality raw materials and advanced techniques in compliance with set market quality standards. Apart from that, this CVG ByPass is made available for our respected clients at rock-bottom prices. 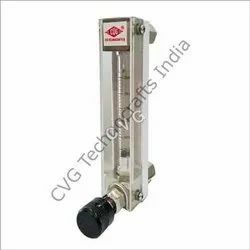 We are known as an affluent and trustworthy entity, engrossed in providing a wide assortment of Glass Tube Low Flow Rotameter. The provided rotameter is used for indicating and measuring flow rate of gases or liquids through cross-sectional area. This rotameter is manufactured by our adept professionals using superior-quality raw materials and advanced methodology in compliance with set quality standards. 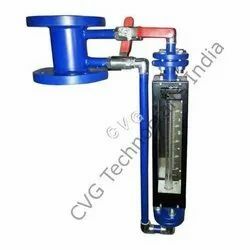 Along with this, our clients can easily avail this Glass Tube Low Flow Rotameter from us at most competitive prices. Backed by our immense knowledge and years of experience in this domain, we are able to manufacture, supply and export top grade Glass Tube Variable Area Flow Meters. These flow meters are mainly used to measure flow rate of various fluids in different industries. The offered flow meters have a glass tube with float (is a cone shaped material) that rises and drops on the passage of fluid. The float in these tubes are generally made from material that is denser than the fluid. These glass tube variable area flow meters are perfect for measuring the flow of liquid and gas in places where viewing process in of utmost importance. It works on the law of variable area - the fluid in metal tube upraised a float in taper tube, which increases the area of fluid passage. The float moves up in proportion to fluid flow rate and get stable when the float weight is balanced through upward hydraulic force. With a magnetic coupling, the movement of inner float by a series of counter weight and linkages. The tube as well as the float unit determines the rate of flow. Digital Meter: High sensitive sensor for magnetic field detection is there to find out the inner float magnetic field. It enables us to display the digital read out. As it operates on battery, this flow-meter does not involve any electrical connection. It has built-in two wire transmitter that provides 24 VDC and take 4-20 mA signal. Flanged to suit customer’s requirement. To suitable specific liquid or gases. It operates on the principle of variable area; the fluid in the metal tube raised a float in the taper tube increasing the area of passage of fluid. The float moves up in proportion to the rate of flow of fluid and get stabilized when the weight of the float is balanced by the upward hydraulic force. By a magnetic coupling the inner float movement through a series of linkages and counter weight. The tube and the float combination determine the flow rate. 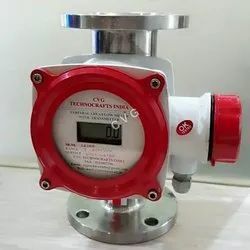 The inner float magnetic field is detected by the high sensitive magnetic field detection sensor, enable us to show the digital readout.As such this flow meter does not require any electrical connection, since it operates on battery. It has an inbuilt two wire transmitter provide 24 VDC and take 4 - 20 mA signal. 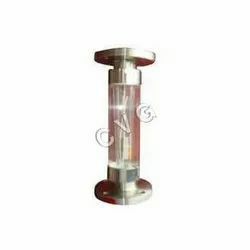 we are leading manufacturers of rotameter for flow meter.